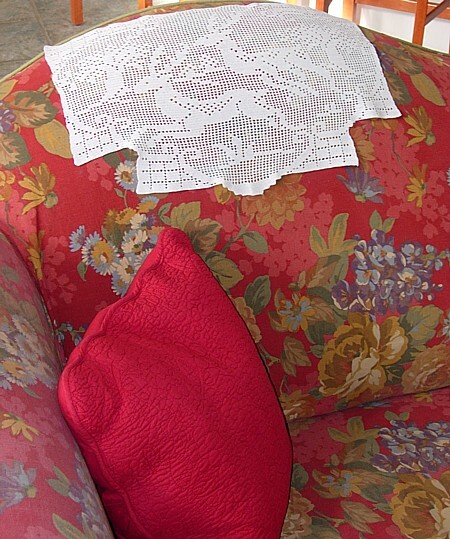 Did you ever see lace doilies covering the back of a chair or couch? Think 18th & 19th century, or Byron. Did you know that at one time they were more than decorative? They had a purpose. You see at one time men of the family oiled their hair with oil of Macassar. It gave them that irresistible look, plus it hid the smell of unwashed hair. Needless to say this oil didn’t do the furniture any good and over time, it would stain it to the point that the material would be ruined. Somewhere along the line, an industrious homemaker came up with the idea to hang a doily along the area where her hubby’s moldy – oily head rested. Problem solved. Easier to wash a doily then to wash a chair. Now the special use doilies became known as antimacassars. Today we see similar chair protectors on the back of seats in commercial airlines or Amtrak coaches. Needless to say, we have a display of these antique doilies in our store. Look for them soon on our repurposed magazine rack. My husband had no idea what an anti-macassar was and I don’t think he believed me when I told him! I had just bought a set that were in heavy linen with mad embroidery. I’ve made them into throw pillows and they’re wonderful. Any linens I find with one end that is embroidered I make into simple envelope closure cushions and use the decorative part as the envelope flap which then sits at the front. So easy to do and very effective. That’s a very clever idea. Thanks for passing it along. 719-646-0160 - Leave a message if we don't answer right away.